The impact small wind turbines placed on homes and business could have on birds and bats is to be studied by researchers at Stirling University. The study will look at the number of the animals killed by micro-turbines, why they may fly towards the machines and possible effects on nesting. Species which may be affected include those that take insects from the air, such as swifts and house martins. Those that nest in buildings, such as starlings, could also be in danger. Dr Kirsty Park, a lecturer in ecology and conservation biology at the university, said: "There have been anecdotal reports of bird and bat fatalities resulting from collisions with micro-turbines, but we don't know whether these pose a threat to wildlife populations or if they are just isolated events. "To date, there have been no studies anywhere in the world to assess the importance of collisions, or any other risks that micro-turbines may pose, to bird or bat populations." 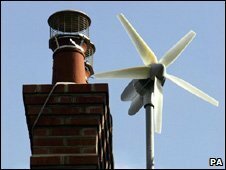 About 1,000 micro-turbines have already been installed on houses, gardens and fields around Britain. Dr Park believes the numbers could be about to increase: "Micro-turbines, whether roof-mounted or free-standing, currently need planning permission, but this may change under current government proposals which will designate 'permitted development' under certain conditions," she said.